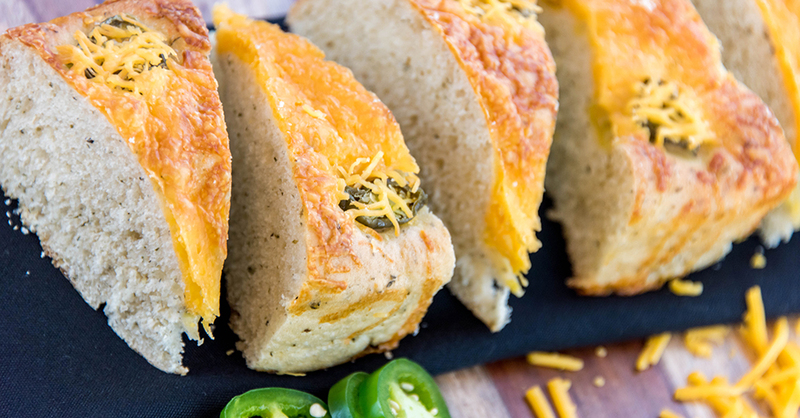 Whip up this simple jalapeño cheddar bread as a spicy complement to your next family dinner. Grated cheddar cheese and sliced jalapeños are a twist on traditional loaves of bread, and cooking the loaf in a Dutch oven shortens the bake time and gives the bread a rustic appeal that we love. This recipe does take some time to make (since you have to leave the dough out for at least eight hours), but the payoff is worth it, trust us! Mix flour, salt and yeast together in a large mixing bowl. Fold in chopped jalapeño and 1 1/2 cups cheddar cheese, and gradually mix in water until a rough dough forms. Cover bowl with plastic wrap and leave on the counter overnight. Preheat oven to 450º F, and place Dutch oven pot and lid inside to warm up for 30 minutes. Turn dough out onto a floured surface and shape it into a round loaf. Using oven mitts, remove Dutch oven and lid from oven, then carefully place dough inside. Cover Dutch oven with lid, place in oven and bake for 30 minutes. After 30 minutes, carefully remove lid and sprinkle remaining cheddar cheese over the top. Place jalapeño slices on top, recover, and bake an additional 10-15 minutes. Remove from oven and place loaf on cooling rack. Serve warm or at room temperature.